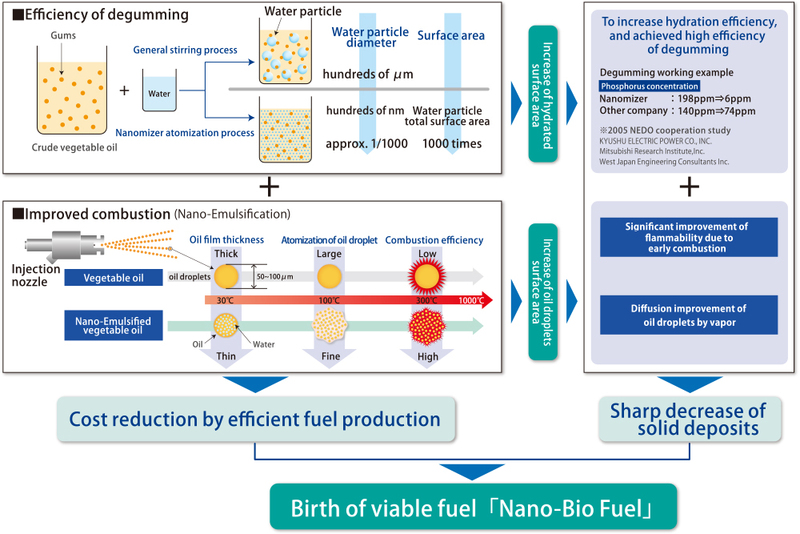 LIQUID BIOMASS POWER GENERATION Technology｜NANOFUEL CO., LTD.
Usually, degumming is to distribute water to crude plant oil, along with the separation of water hydrated, and eliminated (elimination of phosphorus). We enabled degumming extremely efficiently with the surface area as around 1,000 times by scattering the water at nano-size. Furthermore, the flammability is greatly improved by adding water and surfactant into degummed crude plant oil to make Nano-Bio emulsion fuel. By this way, it became able to make crude plant oil such as Jatropha oil, palm oil directly usable fuel to diesel engines extremely at low cost. It is available to control its production cost to approx. 1/10 of BDF which is representative biofuel substituting with light oil. Also, fuel saving effect can be expected by improving combustion efficiency of Nano-Emulsion fuel. To export the technology of liquid biomass power plant to Southeast Asia, the world's first Nano-Bio fuel power generation by using local crude plant oil becomes possible, enabling local production for local consumption of power.